Charles Rennie Mackintosh was an accomplished architect that built incredible, iconic buildings throughout Scotland. He would design every component of the property including the interior design and stained glass windows. The beautiful stained glass he would create to curate these custom built properties has continued to offer inspiration for current buildings. Known most popularly for his stained glass representation of the rose, this design is often referred to as the “Glasglow Rose”. These abstract roses offer brilliant colors and curved lines for a distinct look. Often using a square-shaped stained glass window, Mackintosh stained glass incorporates both Mission Style and Art Nouveau styled stained glass. The geometric combined with free-flow styling is a unique approach to stained glass that has inspired thousands of stained glass artists around the world. Charles Rennie Mackintosh Stained Glass Inspiration for San Antonio Properties from Stained Glass San Antonio on Vimeo. We love creating Mackintosh inspired stained glass for our San Antonio clients. This is a great artistic approach for capturing symmetric and free-flowing stained glass styles in homes, businesses, and offices. Whether you’d like a classic Glasgow rose for your home or would like a custom designed, abstract piece, we’ve got you covered. 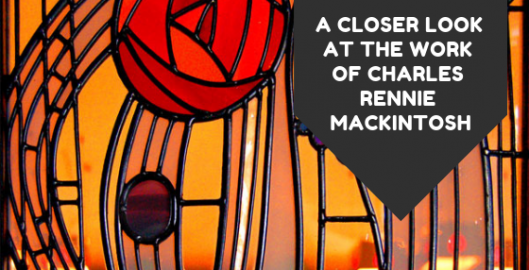 Work with the custom stained glass experts in creating a truly unique piece of art that pays homage to the incredible artist Charles Rennie Mackintosh. For more information regarding Mackintosh inspired custom stained glass, please contact us!